Shopping for Star Trek Scarves? Show your love and keep yourself warm with this Star Trek: The Next Generation Command Scarf. 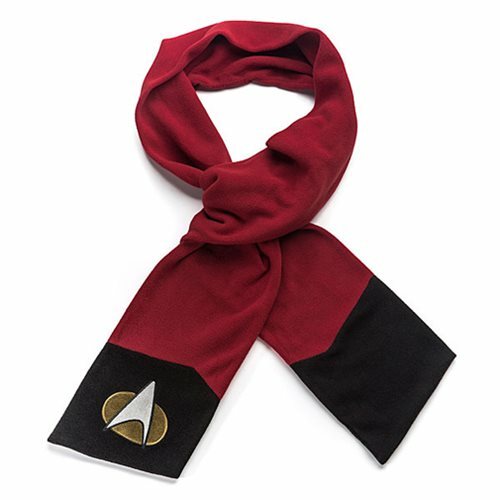 Inspired from the uniforms of the Enterprise crew members, this scarf features the Command division color and a gold and silver fabric division insignia embroidered on the front. Pair with the matching hat for maximum warmth! Bundle up while you're exploring new life and new civilizations with this Star Trek: The Next Generation Command Scarf! Measures about 6 3/4-inches wide x 70 inches long. Hat sold separately. Ages 13 and up.